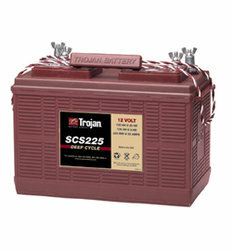 Trojan SCS225 12 Volt GEM CAR Battery Free Delivery most locations in the lower 48. Trojan SCS225 12 Volt GEM CAR Battery Free Delivery most locations in the lower 48*. Prices are with a like core exchanged at the time of the delivery. If you do not have a core you will need to add one core charge per battery purchased. SOME BATTERIES ARE NOT STOCKED AT EVERY WAREHOUSE LOCATION. PLEASE CALL US @ 888-737-5681 PRIOR TO PLACING YOUR ORDER SO WE CAN MAKE SURE THE BATTERY YOU ARE ORDERING IS IN STOCK AT THE NEAREST WAREHOUSE TO YOUR LOCATION.